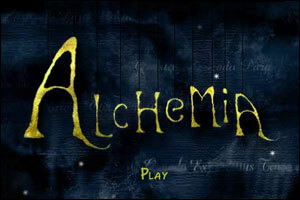 Alchemia is the latest Point’n’Click Adventure game created by Tomas K. (the author of the Haluz series) and Julian Winter. “One summer night in a deep forest, strange events bring little hero and his misfortunate companion to underground caves and dungeons. They discover a city hidden in the dark, with it’s white stone houses, long bridges, strange mechanic creatures and people skilled in ancient alchemic techniques. However, the way back is closed and there seems to be no other way out. Is the little hero able to help his new friend? Will they escape dark tunnels? 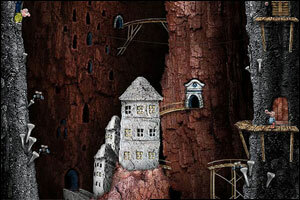 Alchemia is a classical Point’n’Click Adventure game, but also has some innovations. The team plans to create an extended version soon, containing four or five additional levels. But it all depends on how people will like the game. Do you like it? I’m here, kara. Can’t seem to figure out what to do with the tractor…just going backward and forward… how are you doing? I thought it was really cool. I loved the help system (had to resort to it in the clocks scene). I was a bit confused why I’d be helping the machine that just stole my roast, though. At the end, I thought it was waiting on me, but it was just doing its thing. So how do I get him to work the bucket elevator to get back to the dog? what help system? WOW! Thanks for the helpful comments…NOT. Love the game. The pop-up walkthrough was really helpfull. The graphics where nice and the original solutions really made the game. Their English could be better, but who am I to complain. The tractor is actually the hardest part. Great game, wonderful graphic, a nice story! Jackivee – did you not see the walkthrough link at the bottom? It shows you help for the screen you’re on. Wow! Did it 2x just to see the beautiful graphics again. I agree with Andy, something to indicate you are supposed to be waiting during cut scenes, especially when the guy was waiting for a new body. Otherwise, great graphics, and puzzles were not too hard/not too easy, just right. Thanks! Great game. Loved solving the puzzles. Very nicely done!! Wonderful game. Infuriating lag times.Shorten those and I cant wait for the extender version. really loved it. a nice romp through a children’s story. fyi, it forced crashed on me at the tractor scene when i reversed, then went forward without picking up the brick. Is there gonna be Alchemia II? The screen is just black after the scene where the heroes come for a new body. Feels like i didn’t finish it. Posted on Monday, September 7th, 2009. Follow any responses through the RSS 2.0 feed.